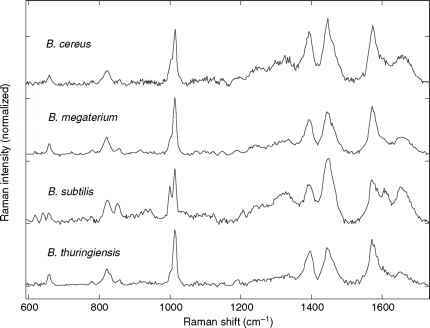 FIGURE 13.9 Micro-Raman spectra of individual spores from four different Bacillus species. Each spectra was collected using the 488-nm line from an Ar+ laser. The signal was integrated for 4 minutes for each spectra. 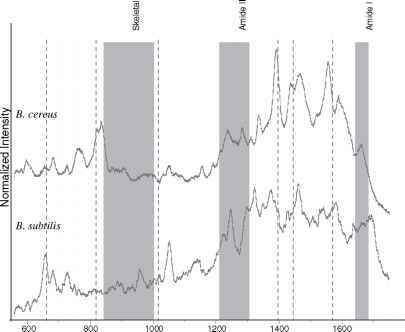 The nearly identical spectra can be attributed to the intense signal arising from calcium dipicolinate in the cortex of the spore. 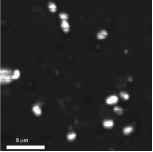 FIGURE 13.10 Surface-enhanced Raman spectra from colloidal silver particles attached to the outside of the spores. The dashed lines show where calcium-dipicolinate peaks would be if they were present in the spectra. Also highlighted are the regions used to identify the secondary structure of proteins. 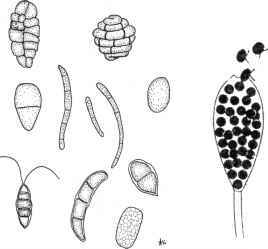 the spore. Figure 13.10 shows the spectra collected from silver nanoparticles attached to spores of two different Bacillus species. What is evident from the spectra is that they are no longer dominated by the calcium dipicolinate as seen with the conventional Raman spectra in Figure 13.9. This result is consistent with the location of the calcium dipicolinate (DPA) in the cortex of the spore, several hundred nanometers away from the nanoparticle probe, thus providing a means to probe the outside structure of the spore. In summary, we have shown that micro-Raman spectroscopy and surface-enhanced Raman spectroscopy provide chemical information of biological materials on the sub-micron scale. These are important tools for forensics analyses because of their high spatial resolution, good chemical selectivity, and high sensitivity. We have demonstrated this by presenting spectroscopic results obtained from single, isolated bacterial spores.